Diwali Puja forms the most important part of celebrations on Diwali festival. Get more details on Diwali Puja dedicated to Goddess Lakshmi. Diwali Puja - Among festivals, Diwali remains unmatched in its popularity, its ubiquitous presence in the Indian culture and the devotion it invokes. Diwali, the day dedicated to Goddess Lakshmi, the goddess of light, good fortune and wealth marks the beginning of Kartik month, falling in October/November. Not only does Lakshmi Puja form an integral part of this festival, it also highlights the social and cultural importance of wealth and prosperity in Indian society. 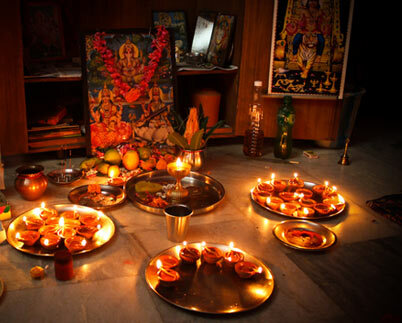 Alternatively known as Deepawali Puja or Dipawali poojan, the puja centres on the Hindu belief of wiping out one's ignorance to emerge into the realm of inner knowledge. As such, Diwali Puja spreads its radiance into everyone's life and touches each soul with joy. In Gujarat, Goddess Lakshmi is worshipped, while in Bengal, this day is associated with Goddess Kali, involving elaborate puja and prasad ceremony well past midnight. In Gujarat, it is also a custom to inaugurate new account books by invoking Goddess Lakshmi's name for the next financial year. It is also believed that on the day of Lakshmi Puja, Goddess Lakshmi visits each household and showers her blessings generously on her devotees for a prosperous year. Hence, in most parts of the country, households complete painting and cleaning work and some take to decorating around the house. It is also customary to make beautifully designed 'rangoli' using rice powder and locally available multi-colored powders, at the doorstep and near the puja area with the tiny footprints of Goddess Lakshmi, as if to mark her auspicious arrival. A series of earthen lamps are lighted at the threshold all through the night. 'Deepavali poojan' is one of the most important features of Diwali celebrations. It is carried out in a ritualistic manner and involves several steps of puja to honour Goddess Lakshmi, Lord Ganesh and the Nine Planets. Initially, Goddess Lakshmi's idol is placed on a pedestal, her feet washed and bedecked with gaudy cloth and jewellery. The traditional Lakshmi Puja involves rituals like placing a 'kalash' or a copper pitcher filled with 'jal' or water, mango leaves, a betel nut, a flower, a coin, and some rice in front of the deity before performing the puja. Pure sandalwood paste, saffron paste, unprocessed haldi, kumkum and coloured powder are offered. A combination of pure ingredients such as milk, ghee, honey and spices along with flowers, such as marigold flowers and 'bel' leaves, are also offered. At most of the places, Lord Ganesha is also seated along with the Goddess and worshipped together to seek their blessings for wisdom and wealth, and to wipe out any maleficent effect of stars on their occupation. Incense sticks, earthen lamps and dhoop are lighted and a 'hawan' is also performed ceremoniously with ritualistic chants. It ends with 'aarti' for Goddess Lakshmi, and the blowing of conch shells as blessings are showered upon the family. Pure ghee sweets are offered to the Goddess and distributed as 'Prasad'. The day of Diwali Puja is also marked by elaborate displays of fireworks and massive scale of traditional and electrical lighting. It is also a time of feasting on traditional sweets, as family and friends come together with gifts and goods to shower on each other. Apart from wearing new clothes, people like to inaugurate new electrical appliances, kitchen utensils and gold jewellery, which they buy on the occasion of 'Dhanteras', held two days prior to Diwali. Diwali melas which used to be part of the cultural heritage in small towns have also found its way into the Diwali Puja celebration in metro cities. As such people look forward to these upscale fairs, where they can buy diyas, candles, ethnic clothing and traditional decoration. The calendar date set for Lakshmi Puja is 27th October, 2019.